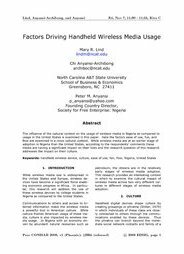 The influence of the cultural context on the usage of wireless media in Nigeria as compared to usage in the United States is examined in this paper. Here the factors ease of use, fun, and flow are examined in a cross cultural context. While wireless media are at an earlier stage of adoption in Nigeria than the United States, according to the respondents’ comments these media are having a significant impact on their lives and the research question of this research addresses the impact on their culture.